To celebrate the anniversary of the Detroit Cougars joining the NHL (at the original publication time of this article), The Hockey Writers is counting down the top 90 Cougars, Falcons, and Red Wings players of all-time. These rankings are based on the players’ contributions to the organization, rather than the sport of hockey. So while Dominik Hasek was an All-World goalie, players like Kris Draper and Marty Pavelich better served the Red Wings organization. This week, we’ll count down 51-60, after revealing 61-70 last week. After joining the Red Wings before the 1994-95 season, American-winger Doug Brown quickly developed chemistry with Sergei Fedorov and Slava Kozlov. Brown combined with the two former Soviet stars to form a high-scoring trio on the ice. One of Brown’s most memorable plays with the Red Wings came in Game 2 of the 1998 Stanley Cup Finals. With the Red Wings trailing the Capitals 4-3 in the final minutes of the 3rd period, Brown stole the puck, walked in, and roofed a shot on Olaf Kolzig to tie the game. Another member of the Russian Five, Slava Fetisov was acquired from the New Jersey Devils in 1995 just in time for the Red Wings to lose to the Devils in the 1995 Stanley Cup Finals. Fetisov would play three more seasons in Detroit, winning two Stanley Cups during that span. His brute toughness in the defensive zone and ability to jump into the play helped make the Russian Five that much better. 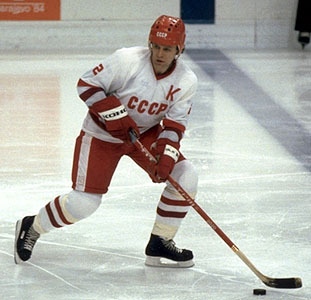 His nearly two decades perfecting the Soviet system certainly helped the others know where Fetisov was supposed to be at all times. Just as the Red Wings’ high-powered offense was taking form, GM Jim Devellano swung a deal to acquire Paul Coffey from the Los Angeles Kings. Upon his arrival, the Red Wings boasted a formidable back-end which included Mark Howe, Steve Chiasson, and a pair of young, up-and-coming defensemen—Nicklas Lidstrom and Vladimir Konstantinov. Coffey’s presence helped Lidstrom develop his offensive game and provided veteran leadership for a young Red Wings team. He also provided plenty of offense—his point per game average is strong evidence of that. You have to be a pretty good goalie to force the Red Wings to trade Terry Sawchuk, who had just won the Stanley Cup, right? 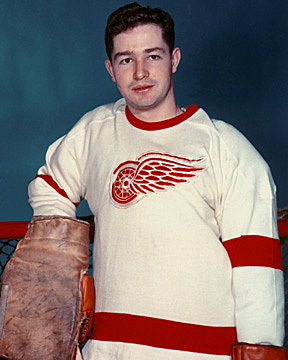 After playing just eight NHL games over two seasons, Hall became the Red Wings starting goalie when Sawchuk was dealt to Boston. Though he only played two more seasons in Detroit, Hall put up sparkling numbers, leading the Red Wings back to the Finals in 1956. More incredibly, Hall had 16 shutouts in his two full years in Detroit. After the 1956-57 season, Jack Adams dealt Hall and Ted Lindsay to Chicago and re-acquired Sawchuk in a separate deal. Similar to Hall and Lindsay, Metro Prystai was another key member of the 1950s Red Wings teams that spent some time in Chicago. Prystai started his career in Chicago, was dealt to Detroit in a blockbuster 1949 deal, sent back to Chicago in 1954, then was finally re-acquired by the Red Wings the next season. Prystai’s best Red Wings season came during the 1952-53 campaign, when he scored 50 points in 70 games. He would add eight points in six playoff contests as well, to lead the team. When the Red Wings acquired Dominik Hasek from Buffalo in 2001, you knew the 2001-02 team was going to be special. To add fuel to the fire, they then signed Luc Robitaille, Fredrik Olausson, and Brett Hull, then welcomed top prospect Pavel Datsyuk to Detroit. In his first year in Detroit, Hasek recorded 41 wins and captured the Stanley Cup with the “Hall of Fame” team. In his two other full seasons in Detroit, “The Dominator” reached the Western Conference Finals (2007) and won another Stanley Cup (2008). The Red Wings captured the Presidents’ Trophy three of the four years Hasek was a part of the organization, as well. Before Terry Sawchuk came along, Harry Lumley was Detroit’s go-to starting goalie. In his six seasons tending the Red Wings’ crease, Lumley helped Detroit reach the Finals four times. The fourth time, Lumley’s Red Wings captured the 1950 Stanley Cup. To thank Lumley for his excellent service, Detroit promoted Terry Sawchuk to be their starter and sent Lumley to Chicago along with star defenseman Jack Stewart, plus others in a deal that brought back Metro Prystai and three other players. Lumley still sits in fourth place for wins and third for shutouts among Red Wings’ career statistical leaders. Part of Detroit’s high-tempo, early-90s teams, Chiasson was a dynamic player on the Red Wings’ blue line. During the 1992-93 season, Chiasson led Hockeytown defensemen in scoring, putting up 62 points in 79 games. This was enough to top the likes of Paul Coffey and a young Nicklas Lidstrom. Following the 1994 playoffs, Detroit traded Chiasson to Calgary for Mike Vernon. While Chiasson was a talented blueliner, the Red Wings needed stability in net. Vernon helped the young Chris Osgood round out his game over the next three years. As one of Detroit’s early superstars, Carl Liscombe parlayed a fantastic, Cup-winning 1943 playoff season into an even better 1943-44 regular season. After leading the champions in points with 14 during the 1943 Cup run, Liscombe scored an astounding 73 points in 50 regular season games. Though his point total was fourth best in the NHL, Liscombe was not named to either the First or Second All-Star Team following the season. As half of Detroit’s “Bruise Brothers”, Joey Kocur was a feared fighter in the NHL during his time with the Red Wings. 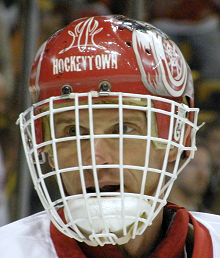 Though fighting was his top talent, Kocur’s leadership and drive to win convinced the Red Wings to sign him out of the IHL after Christmas in 1996. He’d combine with The Grind Line to help Detroit win the Stanley Cup that season and the year after. After retiring, Kocur joined the Red Wings once again as a video analyst and then as an assistant coach under Dave Lewis. Now out of coaching, Kocur currently runs The Joe Kocur Foundation for Children, which is famous for its annual charity softball game featuring current Red Wings, former players, and celebrities. Which goaltender—Hall, Hasek, or Lumley—contributed most to the success of the Detroit Red Wings? Comment below with your opinion.